This mozzarella recipe can really be made in 30 minutes. 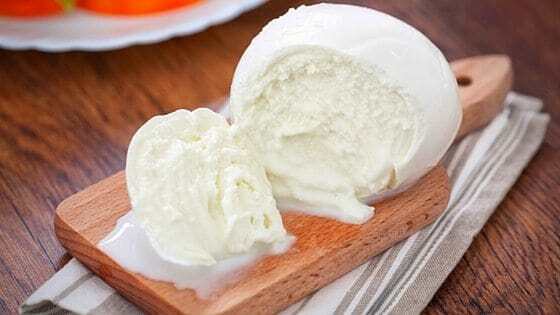 If you’ve never tasted fresh, homemade mozzarella, you’re going to love, love, love this article. It seems intimidating and time consuming, but really, it’s so simple you can do it in an hour. Before you start, make sure you have citric acid on hand (I use lemon juice, but you can buy citric acid tablets at Amazon ) and animal rennet (or vegetable rennet). Here’s where you can buy animal rennet (here’s where you can snag vegetable rennet ). As far as functionality goes, there’s no difference between the two. Citric acid is the same stuff that makes lemons mouth-puckering sour – it’s completely natural, and not dangerous in any way. Animal and vegetable rennet accomplish the same thing: they allow the milk curds to coagulate into cheese. Don’t be intimidated by this – it’s no more involved than measuring out any other liquid. Start with a gallon of milk – make sure it’s not ultra-pasteurized (there will be a UP on the label, or it will say ultra-pasteurized). Ultra-pasteurized milk has been heated to a very high degree to kill off any nasties, but it’s also had the good stuff killed off, so it won’t coagulate properly. For this recipe, you can use 1%, 2% or whole milk. I used 2%. I don’t recommend low fat milk for any cheese or yogurt recipe – I’ve just not had good luck with it. Pour your milk into a large pot, and add your 1/4 teaspoon citric acid. Heat your milk to 90º, stirring slowly. Once it’s reached 90º, remove it from the heat, and add 1/4 teaspoon rennet. Count to 30, stirring slowly. Let the milk mixture rest. Sometimes it takes 5 minutes for it to coagulate, sometimes it takes 1/2 hour. 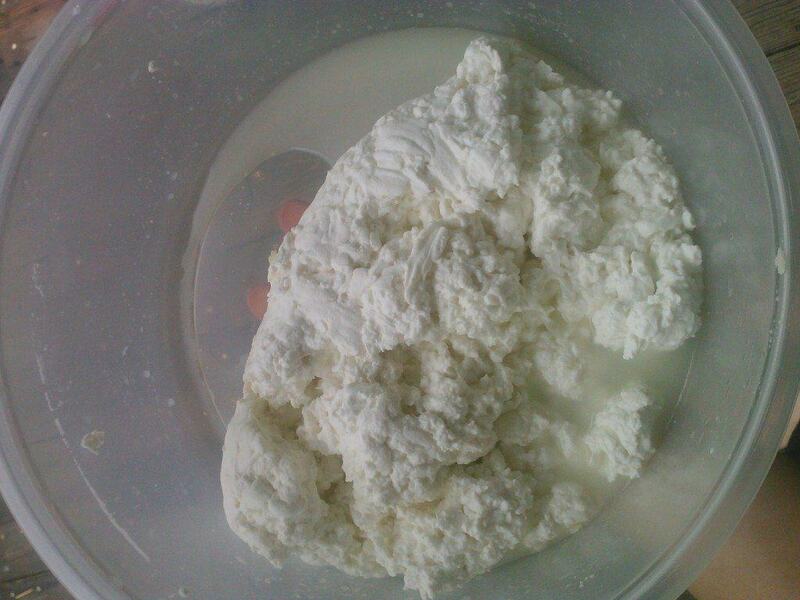 You’ll know it’s done when the milk has solid chunks in it (these are the curds). The cheese curds have separated from the whey . Cut the curds into chunks (still in the pot) using a knife. There will also be liquid (this is the whey). Return your pot to the stove, and heat the curds to about 105º. (I’m not going to lie, when I did this recipe for this article, I accidentally let the curds heat to 140º, and it still turned out ok, so don’t sweat it if you go a little over 105º). As the curds are heated, the separate more from the whey. This is important, because the curds are what will create your cheese. Once the curds are heated to 105º, remove the pot from the heat, and let rest so the curds separate even more from the whey. The curds will start to sink to the bottom. 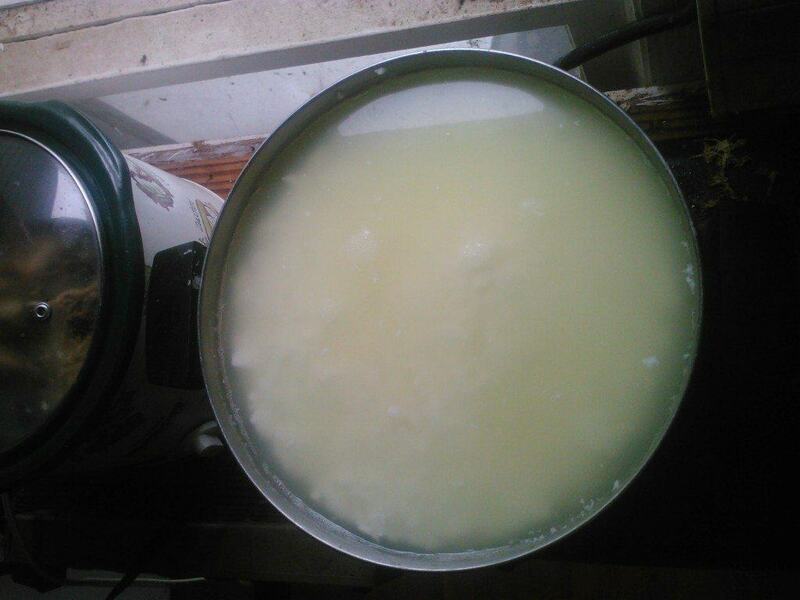 The curds are sinking as they separate from the whey. Next, you’ll want to separate the curds from the whey. You can use a slotted spoon, or butter muslin. I personally use muslin because it’s more efficient. 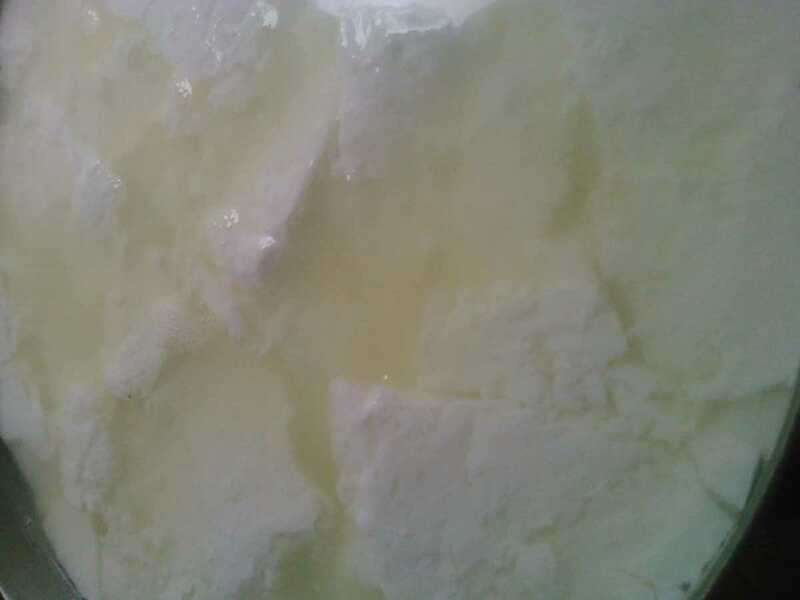 I just place my muslin over a bowl, add the curds and whey, and lift the muslin to allow the whey to drain off. Place the curds into a microwaveable bowl. You’re going to heat them to 135º, 30 seconds at a time. The curds need to reach this temperature so they become flexible and able to be molded into balls. The curds are firmer, and ready to be stretched and molded. Soon you’ll find the curds get more rubbery and solid. Wearing gloves, stretch the curds, and form them into balls. You’re done! You can either eat your mozzarella fresh, or refrigerate and use for a week. 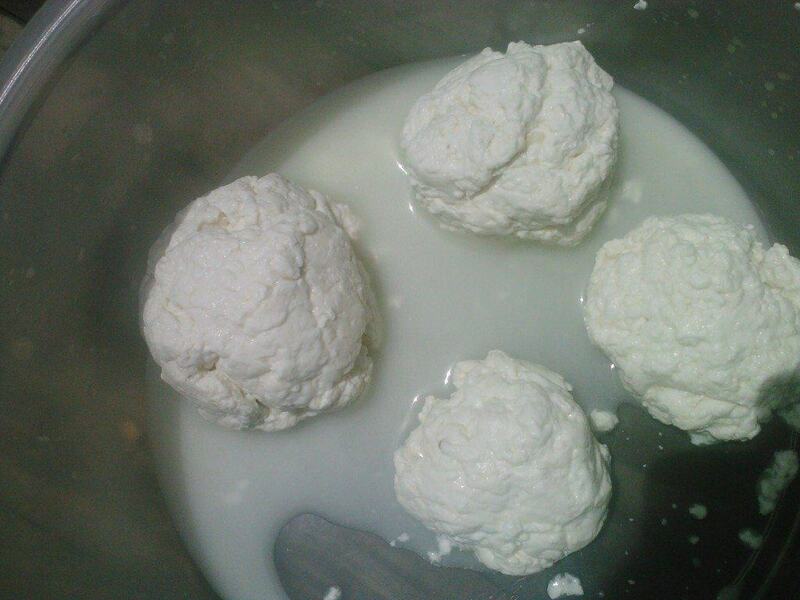 The mozzarella molded into balls. The cheese sounds yummy AND easy to do. One question – – can you make a larger batch or do you recommend a gallon at a time? What can we do with the extra whey? You can try making ricotta (although in my experience the yield is better if you add milk to the whey). You can also drink it (my kids love it) or feed it to animals if your family won’t touch it. Some people put it on their compost pile. Hope that helps! Where can I purchase the rennet? Can I get it from the food store? Hi Lauren, towards the top of the article are links where you can buy both animal and vegetable rennet. If you click the links, they will take you to the products I personally use. I am new at all this. Could you please tell me what butter muslin is? Is there another way for last step besides using microwave? Hi Diana, yes, you can use very hot water and wear gloves to heat the curds and stretch them. I don’t have much experience with it, yet. It seems like a good alternative. Could you half the recipe so you don’t have to use a whole gallon of milk? Or alternatively does the extra mozzarella freeze well? The extra mozzarella will freeze well. I’ve never tried halving the recipe, and with most cheese recipes, unless you’re experienced, it’s not a good idea to go “off script” because there’s the potential for things to go wrong. It’s not the end of the world if that happens, but you might not end up with the cheese you set out to make. Hope this helps. I am confused about the microwave part. Are you putting a thermometer in the cheese . Or do you just keep taking it out until u see the temp this right. I keep removing it until the temperature is right. You don’t want to microwave the thermometer. Hot water is another option. Pour hot water over the curds and stretch. For some people, it works better than microwaving. Hope this helps. Will a nut bag be ok instead of the muslin? I am hoping to try out your recipe tonight and have been able to find everything except for the citric acid. You mentioned lemon juice as an alternative. How much do you use in your recipe? Looking forward to trying this out!! 1/4 teaspoon Citric Acid to 1 Tablespoon lemon juice is what I’ve always gone with!